This page will walk through Angular child routes and relative navigation example. A route can have one or more than one child routes. Child routes can have their own child routes and so on. A route is created using Angular Route interface and array of Route is Routes type. Route has different properties to handle route such as path, component, outlet, children, loadChildren etc. To create child route for a route, we need to use children property. To load child module lazily in application module, we need to use loadChildren property. Module can be loaded eagerly, lazily and preloaded. In lazy loading and preloading, modules are loaded asynchronously. The component corresponding to a child route will open in router outlet of a component related to immediate parent route of the given child route. Child can have path parameters and also it can have empty path. Router supports relative path using ActivatedRoute. When we navigate to a route using Router.navigate() method then we need to pass instance of ActivatedRoute using relativeTo property. When we navigate to a route using RouterLink directive, we need not to pass instance of ActivatedRoute because RouterLink automatically supports ActivatedRoute. 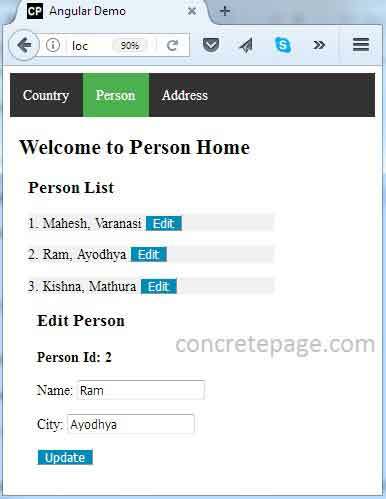 In our example we will create two features, country feature and person feature. Both features will have its own folder, feature module and feature routing module that will follow "Separation of Concerns principle" recommended by Angular. Now we will discuss complete example step by step. Suppose base URL is "/" configured by <base href="/"> in index.html. We will create a diagram that will display the child routes for a component. The components shown in diagram will be used in our demo application. Find the child routes corresponding to the components. Find the diagram that shows child router outlet. We are using all components of our example in the diagram and by arrow we are showing which component will open in which component's <router-outlet>. A component related to a child route is opened in <router-outlet> of a component related to immediate parent route. For example find the following components with their child routes. 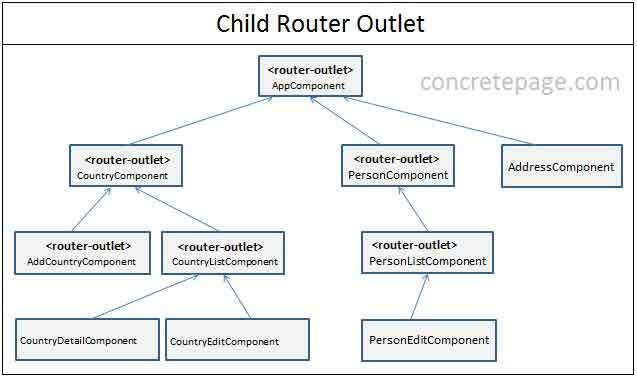 We observe that path of CountryListComponent is the immediate child route of CountryComponent and hence CountryListComponent will open in the <router-outlet> of CountryComponent. 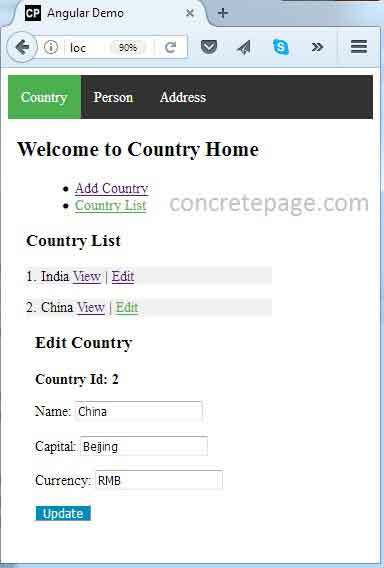 In the same way the path of CountryDetailComponent is the immediate child route of CountryListComponent and hence CountryDetailComponent will open in the <router-outlet> of CountryListComponent. Routes is an array of Angular Route interface. Route is used to define a path. Find the properties of Route interface. path: Defines path for a component. component: Name of the component. outlet: Name of the outlet component should be placed into. data: Additional data provided to component via ActivatedRoute. children: Array of child route definitions. loadChildren: Reference to lazy loaded child routes. redirectTo: Defines a URL to redirect current matched URL. 1. Simple configuration with children property. While creating our angular applications, we should follow angular recommended pattern as given below. 1. Each feature area should reside in its own folder. 2. Each feature should have its own feature module as well as feature routing module. 3. Each area should have its own area root component. 4. Each area root component should have its own router outlet and child routes. Suppose we have two basic features in our demo application such as country and person, then we should use following folder structure and modules. 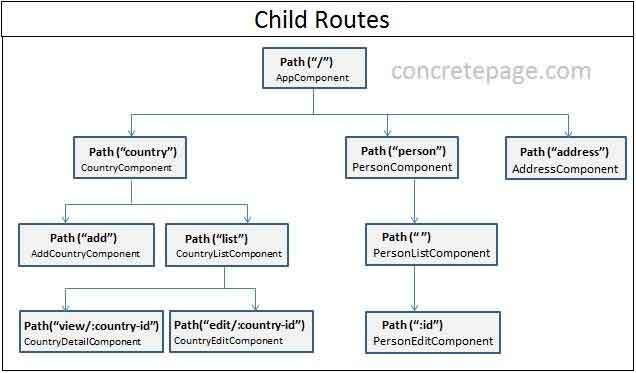 Child routes are created using children property of Angular Route interface. Child routes are configured using forChild() method of RouterModule. Suppose we have country feature. Now find the routing module for this feature. To create routes with path parameter, define the path as given below. The CountryDetailComponent will open for a country id. country-id is a path variable that will accept country id. Find the URL for country id 101. This URL will be accepted by following path. A route can be empty. If we want to open a component by default then we can leave route empty. Find the example. Find the description of routes now. Eager loading is loading modules before application starts. Our main application module (i.e. AppModule) always loads eagerly. To load feature modules eagerly we need to import them into AppModule. We have two feature modules in our example i.e. CountryModule and PersonModule. We will import them into AppModule as following. Our AppRoutingModule will be as following. To load routes in main application routing module, we need to use forRoot as RouterModule.forRoot(routes). Lazy loading is loading modules on demand. To load modules lazily we need to use loadChildren property. Find the steps to load our CountryModule and PersonModule lazily. Step-1: Do not import CountryModule and PersonModule in AppModule. Step-2: Use loadChildren property in AppRoutingModule as following. Step-3: Make parent path empty in PersonRoutingModule and CountryRoutingModule. Preloading is loading modules in background just after application starts. To preload modules we need do a slight change in our lazy loading module code. Find steps to preload CountryModule and PersonModule. Step-2: Use loadChildren property in AppRoutingModule as we did in lazy loading. Step-3: Configure PreloadAllModules strategy using forRoot as following. PreloadAllModules is imported from @angular/router library. PreloadAllModules preloads all modules that are configured with loadChildren property. It means CountryModule and PersonModule both will be preloaded. Our AppRoutingModule will look like as following. Angular router supports relative navigation. For route name lookup, we use directory-like syntax in our path. ./ or no leading slash is relative to current level. ../ is used to go up one level in path. Now we will understand relative navigation using Router.navigate() method and RouterLink directive. To support relative navigation to Router.navigate(), we need to pass ActivatedRoute using which router comes to know where it is in current route tree. To pass ActivatedRoute we need to use relativeTo property. To get the instance of ActivatedRoute and Router use the constructor. Now suppose a component has following source and target route. Now Router.navigate() will be used as follows. If we want to use absolute path, then write the full path. Disadvantage of absolute path is that if the path /country is changed then we need to edit our component code to change the path, too. RouterLink directive has support of ActivatedRoute automatically for relative navigation. We can use relative path and absolute path both with RouterLink directive. In our example we have two features. Every feature resides in its own folder with its associated files. We will provide code feature wise. We will load our feature modules eagerly. Find the project structure of our application. Here we will provide complete code of country feature. CommonModule includes all the basic Angular directives such as NgIf, NgFor, NgClass etc. Now find the print screen of feature one output. Here we will provide complete code of person feature. Find the print screen of feature two output. Find application module and other components. 2. In your angular CLI application, replace src folder from the downloaded one. To install Angular CLI, find the link. I am done now. Happy Angular 2+ learning!